The Brewers went with a bullpen by committee to secure this win. It started with Dan Jennings getting the first out of the game by retiring Matt Carpenter for his only batter faced, and it finished with Corey Knebel slamming the door in the 9th for his 16th save. In between, the Brewers used seven other pitchers for a total of nine for the game. Corbin Burnes (7-0) got two outs for the win. Chase Anderson was supposed to start but manager Craig Counsell announced Sunday that the Brewers would be going with a bullpen game instead. 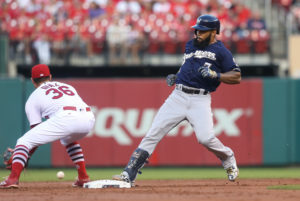 The Cardinals went in front 4-3 in the sixth when Jose Martinez and Marcell Ozuna homered off of Brewers lefty Josh Hader, but the Brewers bounced right back to tie the game the next inning. The Brewers will send Gio Gonzalez (9-11, 4.28 ERA) to the mound in game two of the series tonight against Cardinals left-hander Austin Gomber (6-1, 3.63). Gonzalez is 2-0 with a 1.65 ERA in three starts since he was acquired in a trade with Washington on Aug. 31. Gomber won his last time out, an 8-1 victory in Atlanta.